According to a Securities and Exchange Commission filing released Wednesday, Berkshire owned 252,478,779 shares of AAPL at the end of September. The stake accounts for nearly 26 percent of the portfolio, up from just under 24 percent in the preceding quarter. Whether Buffett unloaded — or loaded up on more — Apple stock since the reporting period ended is unknown. Berkshire's latest investment continues to illustrate Buffett's confidence in the tech giant, even in the face of concerns that sales of iPhone, Apple's most important product, have peaked. During its most recent quarterly earnings conference call, Apple said it will no longer report iPhone, iPad and Mac unit sales. The major shift, while in line with reporting practices adopted by other tech companies, prompted speculation that Apple wants to put a veil on iPhone sales numbers, which are no longer booming. During the most recent quarter, iPhone growth was flat year-over-year, and last quarter sales were up by a single percent from 2017. "A unit of sale is less relevant today than it was in our past," Apple CFO Luca Maestri said during the conference call, adding that the number of units sold does not necessarily represent the relative health of a product's underlying business. Indeed, Apple is making more money than ever from iPhone, with premium pricing driving a surge in average selling price. For the fourth quarter, iPhone ASP touched an all-time high of $793. Buffett appears to share Maestri's view of market health. In an interview earlier this year, the "Oracle of Omaha" explained why Apple represents a solid investment. 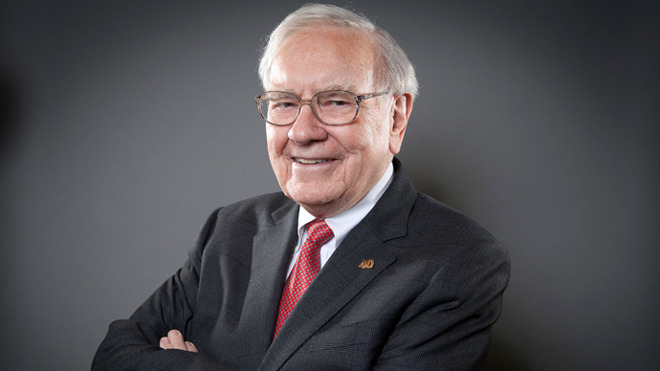 "I do not focus on the sales in the next quarter or the next year," Buffett said of iPhone. "I focus on the — they won't tell you exactly how many — but hundreds and hundreds and hundreds of millions of people who practically live their lives by it. And if you look at that little...piece of whatever it is, it's some the most valuable real estate in the world." Berkshire first bought into Apple in 2016 with a share purchase worth about $1 billion, a figure that was extended to 57.4 million shares at the end of 2016. That stake increased to 133 million shares a quarter later. Berkshire is now Apple's third-largest shareholder behind investment management firms Vanguard and BlackRock, with an approximately 5 percent stake in the company.